Ok, so you want some large scale senior prank ideas that you play on your school. After all, it's your senior year and you want to be remembered for the greatest prank ever. So here are 4 you can try. First, beware that you may have a fair bit of planning to do before you execute these prank ideas. Since it's large scale, it's always in danger of being discovered by school custodians before it's appreciated by the general school population. So if you have rapport with the custodians (or janitors), offer to help clear it up when it's done in exchange for turning a blind eye to the pranks. These senior prank ideas won't result in a mess to begin with, so cleanup should be fairly straightforward. For this senior prank idea, you will preferably need some help from your fellow seniors. Together, you'll be creating a legion of fake toilet guys who will be occupying all the toilet seats in the school. You'd better wish that you don't get a stomach ache on the prank day. Here are the instructions for making the toilet guy. 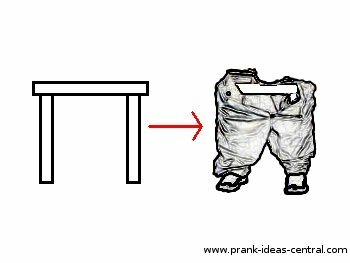 Don't make them yet, but prepare the materials needed for the actual prank day. For each of these fake toilet guys, you can construct a pair 'legs' from cardboard or pipe, by taping 3 tubes together with duct tape. The result is as shown in the picture above. To clothe these legs, your group can easily purchase used pants (more or less $5 each) and shoes (varies) in bulk. Make sure the clothes and shoes you select are typical of the students in your school. If your school has a uniform, either sacrifice one pair of pants and shoes each or contact the seniors before you to donate theirs to a worthy cause. And yes, we're using fake toilet 'guys' in the ladies bathroom too. Adding sound effects is an optional step. Your group can purchase cheap playback devices to play back a loop of hours of random farting, peeing, straining noises and poop dumping noises. Fit it with some good batteries to make the playback last throughout the day. For the electronic savvy, you might want to rig the tape recorder to size D batteries instead of the standard AA so that they'll play longer. Make sure you record a couple of hours worth of random farting, pee sounds, straining and dump splashing noises on the tape. You'll only need 1 or 2 of these mp3 players (with speakers) per toilet. Each can cost as low as $9, but you'll need to do some bargain hunting before hand. On the day of your prank, assign a stall to each of your accomplices. Everyone should have the ingredients for the fake legs (cardboard tubing and some duct tape), a pair of shoes, a pair of pants, and the optional loaded mp3 player (for a few individuals) in their backpacks. When your team enters a toilet, paste the "Closed for Maintenance" sign on the door and wait for the toilet to be emptied. Improvise with the yellow no entry tape if your school toilet entrance does not have a door. While waiting your team can enter the free toilet cubicles and make their fake toilet guys. Don't play any of the mp3 players until the toilets are empty. Post a lookout outside and keep in touch via your cellphone. Make sure the call is connected throughout the prank as it will take some time to dial and connect to you - that usually means it's too late and you're caught. Once the toilets are empty, quickly finish up making and dressing the toilet guys in the toilet. Start your mp3 players to play and lock the toilet stall doors from the outside. Locking them from the outside really depends on the mechanism of your school toilet door, so you'll have to figure it out. Most can be done with a string. Alternatively you can lock it from the inside then crawl from under the stall, if there is enough space, and if the floor is clean enough. Once complete, evacuate the toilet and remove the sign/tape. Move on to the next toilet if you haven't finished. Enjoy the buzz that your prank will create. Picture walking through your school hall one day and you feel that something's different. Everyone seems to be laughing and pointing at the pictures in the halls. You look closely and - lo and behold - all the pictures of people (and animals!) 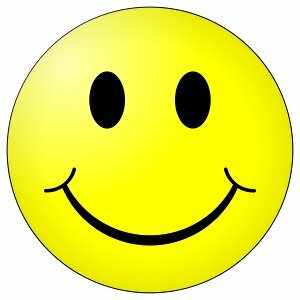 in school have a nice round and yellow smiley face on them. Guess who's going to put them there? You are, of course. It makes sense to get help for this senior prank idea as it will rather overwhelming for an individual to do. Make sure you take a detailed tour of your school. After all, you won't be seeing it after senior year (hopefully!). Inventory every single head in every picture available and estimate the diameter of the smiley head needed to cover the faces in each picture, in each hall and room. Don't spare any heads, not even faces on the advertisements on the drinks machines, or year pictures of classes. Even animals and inanimate humanoids (like robots) shouldn't be spared. Remember to categorize all of these by location (makes it easier to divide the prank setup tasks). Once you have the logistics done (phew! ), what's left is to this senior prank idea. For really tiny smileys, I suggest that you order stickers that print in the thousands. You can print and cut out the bigger ones yourself. Use double sided tape to hold them up. If you want to be all that more annoying, use stronger liquid adhesives. When the supplies of smileys are ready you'll need access to the school off hours. Leave the back door unlocked and sneak in if you can. Hopefully your school is cool enough to allow senior pranks in senior year. Otherwise sneaking in will be a risky thing to do - there's always plan B for that. Once you're in I'm sure you know what to do (stick the smileys, of course!). If you can't get access to the school, you'll need a lot of help to execute this senior prank idea quickly. Assign everyone to a photo or an area in the school to stick the smileys on. Do it gradually, for example 10 smileys per person between each class. If 100 seniors are involved, that should be 1000 stickers per class session. By the end of the day your mission would probably be accomplished, except for a few portraits at hard to reach parts of the school. In this senior prank idea, the objective is to obstruct a hallway, stairs or classroom with cups full of water so that it will be impossible to pass through quickly without spilling the cups over. At it's simplest, your senior team will just lay out a lot of cups covering the area and fill them with water. The downside to this simple prank is that the school custodians may just easily pour the contents into a bucket and remove them one by one. So I'm going to propose a variation that will make it a tad more annoying and more artistic. Purchase your paper cups according to the amount you think will cover the area. About 20000 should be enough to obstruct a hallway. Please don't use Styrofoam as it's not environmentally friendly - it doesn't degrade in landfills for ages. Well, you'll need someone to lay the cups, another to staple them together, and another to fill them up as you go along. Don't staple ALL of the cups together before filling, otherwise you'll have some trouble getting to most of the cups. If you want to spell out some words as a message from your team, e.g. "Seniors Year 20xx", be sure to buy cups of different colors to put into the mix of cups. You might want to experiment with food coloring to achieve the same effect. If you want to be a bit more artistic, instead of just blocking the highway, you can fashion mini 1 man width roads with your cups that people can walk through to get to their classes. It will still cause some chaos, but at least this way people can still view your work up close. Have an epic battle play out in the hallway of your school. In this senior prank idea, you'll need access to the school during off hours. You simply need to arrange the army men according to your vision of the battle. You don't limit yourself to green army men in this senior prank idea. You can always set up alternative scenes, like Cowboys and Indians or whatever toys you can get your hands on. Add a Jedi warrior in the middle of the battle for some comic effect. Adding aircraft to the scene is not impossible, if you can reach and hang it from the ceiling.